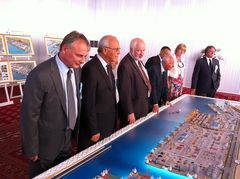 At the invitation of the Government of Turkmenistan, 15 august, Mr. Eduard Biriucov, TRACECA Secretary General took part in the in the ceremony of laying of the foundation stone for important infrastructure object - International sea port in the city of Turkmenbashi. 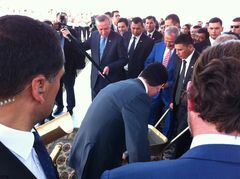 At the ceremony, in the presence of ambassadors of the Caspian countries and representatives of the international organizations, Mr. Gurbanguly Berdimuhamedow, President of Turkmenistan and Mr. Recep Tayyip Erdogan, Prime-Minister of Turkey gave a symbolic kick-start to a new construction. A new port on the Caspian Sea will become an important link to form state-of-the-art transport infrastructure which will allow bringing economic and trade cooperation between Asia and Europe up to a new level, give powerful impetus to the long-term development of inter-regional relations and open up strong possibilities to increase transport flows in the Eurasian area. The period of construction of a new international sea port is 48 months. With the view of developing and implementing the project there was held the international tender including 7 major companies specialized in this field. On the outcomes of the tender the Turkish company “Gap Insaat” became the winner and general contractor of the project. The project of a new International Sea Port in Turkmenbashi provides for the construction of ferry, passenger and container terminals. The complex will include a common loading terminal, bulk cargo terminal, as well as the plant for construction and repair of ships. The total area of a multifunctional port is more than 1 million 200 thousand square meters. The total length of the berthing line will make 3 thousand 607 meters. Apart from the construction of waterfront structures it is envisaged to build numerous units of waterside infrastructure to include transport support as well: roads with elevated interchanges of the total length of 2200 meters and railway lines of the total length of 5300 meters.